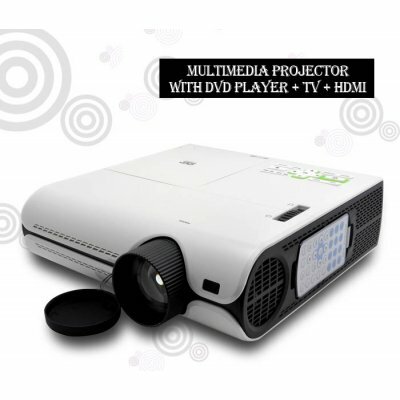 Successfully Added Multimedia Projector with DVD Player + TV + HDMI to your Shopping Cart. Multimedia Projector with DVD Player + TV + HDMI. An incredible digital media projector, the CVGI-E28 offers an unbeatable mix of multimedia functionality with its high quality video projection plus region-free DVD player along with a built-in analog TV receiver . With an impressive image size capability and display brightness, this Multimedia Projector provides rich colors and vibrant image clarity for classroom, home and work use to deliver a superb multimedia viewing experience for every occasion. Using a handy VGA input, this flexible unit is perfect for use in conjunction with laptops, netbooks or notebooks. Deliver your presentations in style and with convenience in a number of settings (office, conference rooms, classrooms, etc.). When you are not working, the CVGI-E28 will immerse you in an exciting world of digital entertainment. Capable of projecting crystal clear screens up to 2m in size, you can use the HDMI, S-Video and AV connections to indulge in cinematic entertainment and high-intensity gaming right in the comfort of your own home. Enjoy your favorite movies in the size fitting the king of the house - you! The CVGI-E28 is an incredible multimedia tour de force, equally adept at helping you deliver the perfect presentation at the workplace or capturing your imagination at home with its multimedia entertainment options. Enjoy all your favorite digital media with your family and friends, while making the most of special occasions like parties with you as the perfect host. Capable of being a substitute for a large screen TV, this fully-featured projector truly offers you a world of digital possibilities. Order yours now and start enjoying big screen entertainment next weekend! Important Note: This multimedia projector has input modes and connections for many devices. See the detailed product notes below in how to get the best performance from your new home video system. This multimedia projector has many input modes. If you get a blue screen when you start up the projector, that probably means you are in VGA mode or a video mode without a current input. Changing to the proper input mode will allow you to see your video. Oh, can I burn some games onto DVD and play them on this system? Does this system play Nintendo Wii games? This system does not play any Nintendo Wii games. If I put this into my online store inventory, do you have any keyword suggestions for me? What formats does the DVD player support? Gostei muito da imagem e da funcionalidade, realmente ele vale cada centavo que paguei. Muito bom! Recomendo. Este proyector es tal como se menciona, presenta buena imagen, buen sonido, y hubiese sido aun mejor si el brillo fuese más intenso, pero esto no quita que este proyector sea buenísimo, estamos encantados más aun cuando estas preparando una presentación y dejas a las personas viendo televisión mientras preparas todo o alguna película sin necesidad de ocupar el notebook. the projector really bring me life during weekends..sharp and clear fast delivery...Sop more on your products. Juz got it and waiting to try this weekend.